Honda Motorcycle and Scooter India (HMSI) has launched the 2018 CD 110 Dream DX in India at a price of Rs 48,641 (ex-showroom, Delhi). 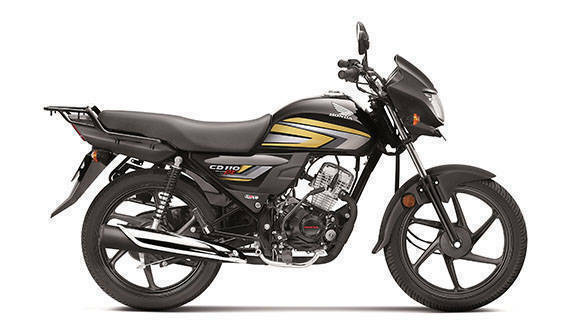 The 2018 Honda CD 110 Dream DX variant is an update on the previous iteration from 2016 and is priced a nominal Rs 956 higher than the latter. (Note: Initially, the price for the 2018 Honda CD110 Dream DX announced yesterday was Rs 48,772, which was later corrected by Rs 131 to Rs 48,641 later in the day.) For 2018, the CD 110 Dream DX receives some practical and cosmetic changes. The seat contour for the rider now appears to be shallower, and there is a carrier instead of the rear grab handles for added practicality. The Honda CD 110 Dream DX sports black alloy wheels replacing the silver ones, and a chrome finish exhaust heat shield, replacing the earlier black finish. The addition of the rear carrier on the CD 110 Dream DX seems to indicate that Honda 2Wheelers is primarily targeting the rural market. It also sports new graphics on the side panels under the seat. The 2018 CD 110 Dream DX receives a new paint option - New Black with Cabin Gold, in addition to the Black with Green Metallic, Black with Grey Silver Metallic, Black with Red and Black with Blue Metallic options. The CD 110 Dream DX continues to be powered by the same air-cooled 110cc HET engine producing 8.42PS and 9.09Nm. Apart from the kick, it also has a self-start. The engine comes mated to a 4-speed gearbox. Honda claims a fuel efficiency of 74kmpl with the Dream DX. Speaking at the launch, HMSI senior VP - sales and marketing, Yadvinder Singh Guleria said, "We are confident that the new edition too will garner good response from our customers especially when there are sentiments in rural demand". HMSI states the CD 110 Dream DX traces its legacy to Honda's first mass motorcycle Dream D which was launched in Japan in 1949. The CD moniker itself exists since 1966.